At Ricky Tyler Landscapes, we offer customers in the Barnet area complete garden and grounds maintenance services. No matter what size your garden, commercial or residential grounds are, we’ve got the experience and the fully trained staff to keep your grounds in tip top condition all year round. Everyone loves to see and enjoy a well kept garden or landscaped area, but it takes time and effort as well as know-how to keep the grounds looking their best. Our teams carry out all aspects of grounds maintenance and commercial landscaping in Barnet and the surrounding towns such as St Albans, Watford, Enfield, and Edgeware. When you need a reliable business and commercial gardening and landscaping service at highly competitive rates, look no further than Ricky Tyler Landscapes. No job is too big or too small for our skilled staff, who are fully insured and trained in the safe use of all our modern equipment and materials. If you need tree works done at your commercial or residential grounds in the Barnet area, we can do that. If lawn care and turfing, or general landscaping jobs – inside or out - need doing, we can do that too. We have been providing residential and domestic gardening services to customers in the Hertfordshire and Potter’s Bar area since 2002, and have since extended this to cover towns like St Albans, High Barnet, Waltham Abbey, and many others in the Greater London area. So if you need professional garden maintenance services at your care home or hospice, we provide all-year round ground care, including lawn mowing and treatment, tree surgery, specialist spraying services, and landscaping. 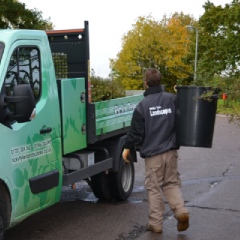 We remove any cuttings or garden waste we produce and make sure it is disposed of in an environmentally-friendly way. We can provide suitable compost for your grounds, and other kinds of ground cover products. Our team can also carry out driveway and patio refurbishment. In short, whatever gardening maintenance needs doing in Barnet and beyond, Ricky Tyler Landscapes has the answer. Ricky Tyler Landscapes can provide gardening and grounds maintenance services including Barnet Grounds Maintenance covering Barnet, London .